Room Divider Screens Boasting Iconic Images of American Culture. 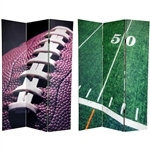 Western, patriotic, monumental themes printed on a 6ft tall folding screen. Double sided art print room dividers, with durable stretched poly-cotton blend canvas. Lightweight, portable, attractive, easy to clean and functional. Experience the "Americana" culture with our themed screens of various different American monuments, cities, and landmarks. Pictures of the Grand Canyon, Mount Rushmore, Washington DC, New York City in vibrant color and dramatic and classy black and white. All art print room dividers folding screens measure 15 3/4"W x 70 7/8"H for each panel. Please note, if you are purchasing a 3 panel screen and want it to be free standing, it is recommended to purchase the stand.